붉은박쥐는 우리나라 전역에서 소수 분포한다. 암수의 성비가 1:10∼1:40 정도로 멸종위기에 직면한 야생동물이며, 근래에 들어서는 자연굴에서는 발견되지 않고 폐광에서만 발견이 되는데, 최근에 많은 폐광의 입구를 막음으로서 서식지가 사라지고 있다. 전남 나주, 함평지역에서 예외적으로 집단 겨울잠을 자는 것이1999년에 발견되었는데, 이것은 서식지 파괴에서 비롯된 현상으로 보인다. 동아프카니스탄, 북인도에서 한국, 일본, 대만, 필리핀 등에 분포하며 일본의 대마도에서 몇 개체가 채집된 기록이 있으나, 우리나라의 개체가 날아간 것으로 보인다. 우리나라의 애기박쥐와 박쥐 중 중간크기로 몸길이는 약 42.75∼56.55mm정도이다. ＇황금박쥐＇라는 애칭이 있을 정도로 예쁘고 귀엽게 생겼다. 몸의 털과 귓바퀴·날개의 골격부분의 색은 오렌지색이며, 귀바퀴와 날개막의 색은 검은색이다. 뒷발은 작고 검은색이며, 날개는 바깥쪽 발가락 끝 부분에 붙어 있다. 여름철에는 대나무 밭이나 삼림, 고목의 둥치에서 휴식을 취한다. 겨울잠을 자는 시기가 보통 11월에서 이듬해 3월까지이며, 습도가 높고 따뜻한 동굴의 안쪽에서 한·두마리씩 겨울잠을 잔다. The Korean orange whiskered bat (Myotis formosus tsuensis) is found in small numbers across the country. It is an endangered species, with the ratio of female to male bats pegged at 1:10 -1:40. 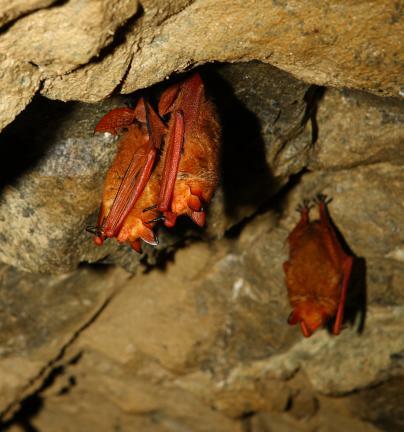 These days, they are found not in natural caves but in abandoned mines; with the entrances of many mines being closed, however, the bats are losing their habitats. 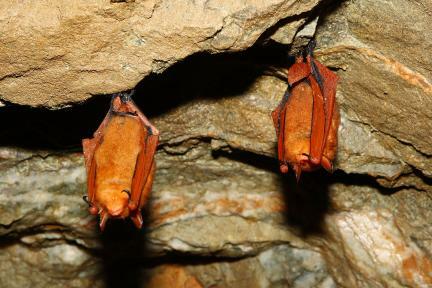 In 1990, a group of these bats was unexpectedly discovered hibernating in the Naju and Hampyeong regions of Jeollanam-do, probably because of the loss of their habitats. The bats are found in Eastern Afghanistan, Northern India, Korea, Japan, Taiwan, and the Philippines. Several of them were found on Tsushima Island, Japan, but they likely flew over from Korea. 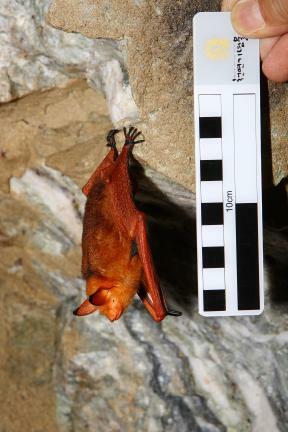 In terms of size, the Korean orange whiskered bat is around 42.75-56.55mm long, somewhere between the parti-colored bat (Vespertilio) and the bat (Chiroptera). 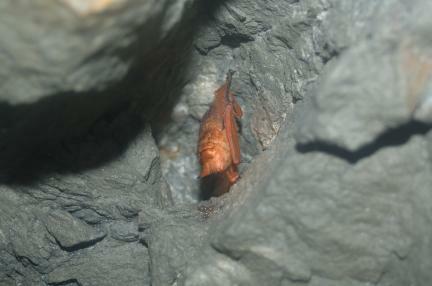 It is an attractive and endearing creature, fondly called “golden bat” in Korea. The bat’s body fur, ear rims, and the valleys in the wings are orange, whereas the nervure is black. The back legs are small and black, and the wings are attached to the ends of the outside toe. In summer, the bats live in bamboo fields, forests, or trunks of old trees. 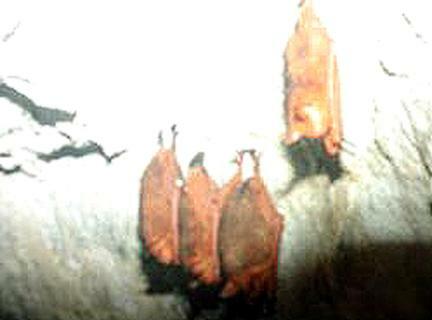 They hibernate from November to March the following year, mostly in small numbers, in warm, humid caves.